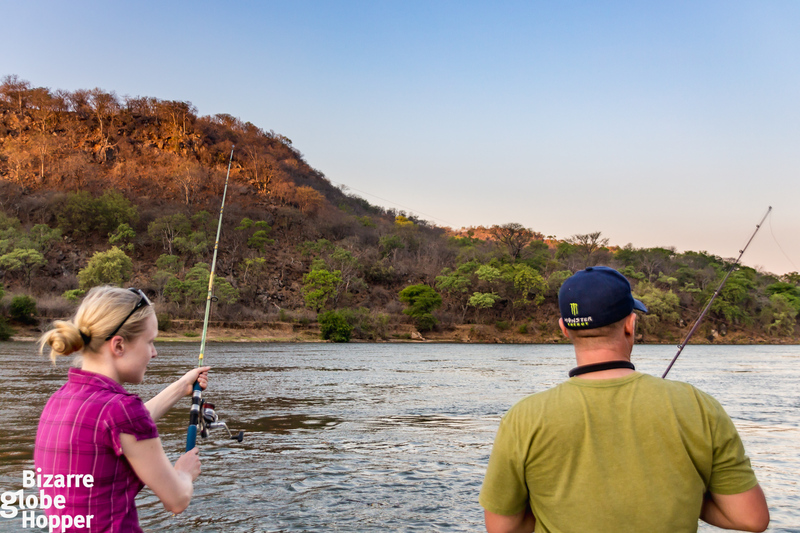 Catching the famous tigerfish on the Zambezi River is one of the fishermen’s dreams. Last time I had been fishing was with my grandpa when I was a kid, but when we had the chance to go tiger fishing in Zambia, we embraced the opportunity. 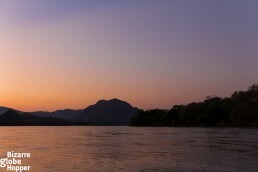 It was seven o’clock in the morning and the sun had already risen over the great Zambezi River. We sipped strong coffee and ate a hearty breakfast as to survive our day ahead. We were going out fishing the famous tigerfishes twice today – in the morning and in the afternoon. My first feeling was somewhat amused at the thought that we’d be going out on a small boat to the Zambezi with some live baits and spinning rods, to catch some fish. It also brought dear memories into my mind. When I was a kid, I used to go fishing with my grandpa all the time and he taught me to be quite an expert in using the spinning rod. But those days were long gone and nowadays I didn’t have a clue about fishing anymore. I hardly even knew how the tigerfish looked like. However, I felt curiously excited and thought that if I had once known how to do it, I’d remember it again. And our boat was already waiting for us down at the wooden dock of the Redcliff Lodge. 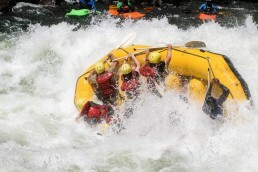 Our little boat was packed with equipment and off we veered to the Zambezi River. I felt the wind and the speed of the boat on my face and I thought of how my grandpa would have been more than excited about this kind of adventure and I suddenly felt so happy. We had the privilege of having the boat for just the two of us, with our guide and instructor onboard. We traveled to the upper stream and after about fifteen minute’s ride, our guide stopped the engine and began to prepare our fishing rods. “This will be a good spot. There are lots of fish here”, he said. I felt a funny tingle in my spine when I took hold of the fishing rod and listened to how should I throw it as far as possible towards the open river water. 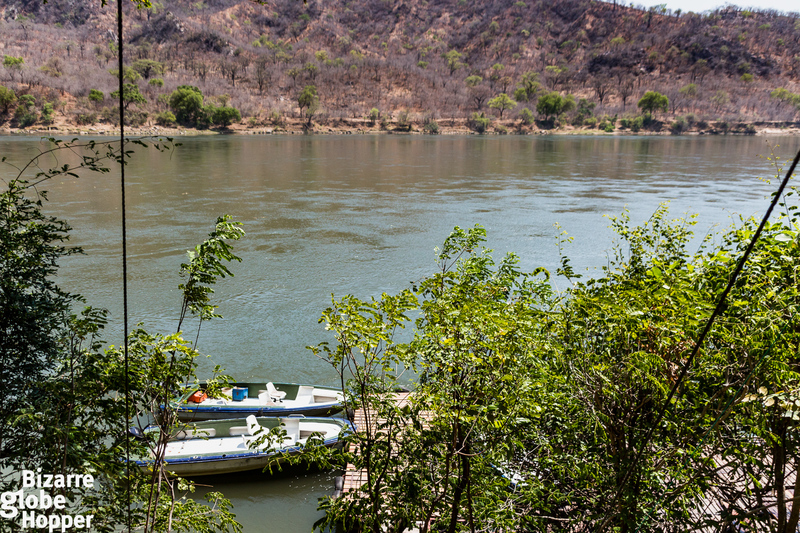 The Zambezi River isn’t very broad here but there are lots of “shady”, perfect spots for the fishes to lurk in. I quickly got a hold of the fishing rod and the wheel. I messed up the fishline only once. I just needed a couple of practicing throws and I remembered – after all these years. My grandpa would’ve been proud. 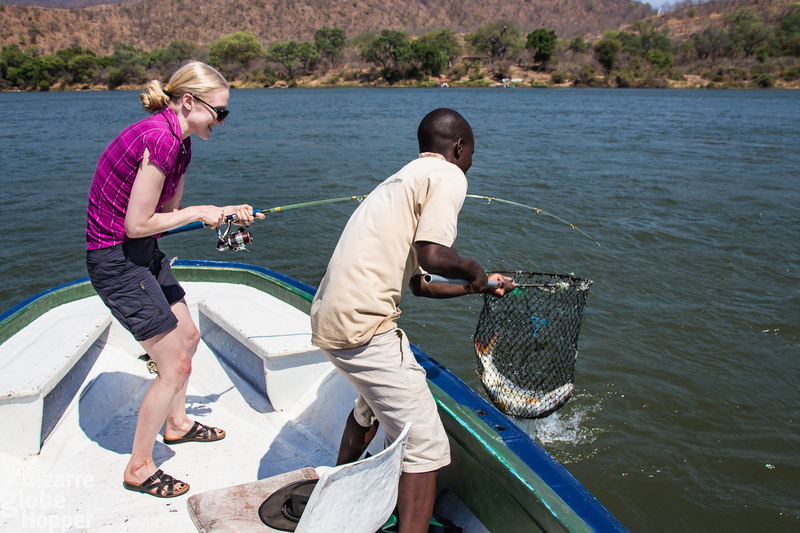 So there we were, on a tiny boat in the middle of the Zambezi River in Africa, shucking tigerfishes. We soaked in the tranquil atmosphere and realized how soothing experience fishing can be. Niina had to practice a little bit more of the throwing of the fishline, but that was no disadvantage since eventually she was the first to catch an iconic tigerfish. I was busy dodging her hook, whirling through the air, and all of a sudden there was a catch at the end of her line. That put out an adrenalin rush through our veins when she started to reel the beast into the boat, trying to obey our guide’s instructions. I quickly grabbed our camera and took photos as proof, while Niina was struggling with her rod. It sure didn’t seem like an easy task. In fact, it was so hard that I had lost mine a few moments earlier. The fish had just struggled itself loose when I didn’t manage to reel in properly. But this time, it looked like Niina would succeed. Our guide tried to give instructions on how to reel and how to give loose to the tigerfish – to exhaust it. He helped Niina with the rod and when the fish was near enough the boat, he grabbed the net bag. The tigerfish looked enormous when it was jumping and battling against the hook in its mouth. “Fish of this size put out the strongest battles,” our guide told us while he managed to pick it up from the water. 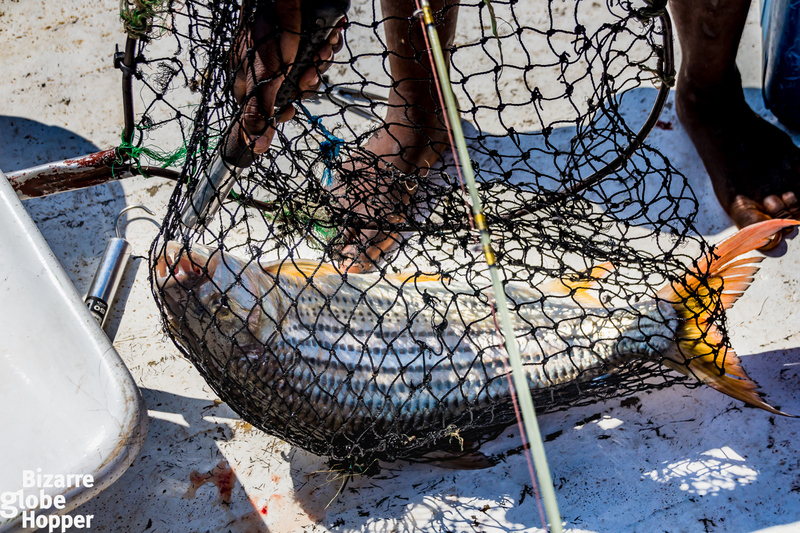 The tigerfish splashed onto the boat’s floor and it truly was big! I watched with amazement while he lifted it with a scale that showed: 4,5 kg. Despite its size, what scared me more was the sheer size of its teeth! They looked like a row of white, bone knives, needle-sharp. Getting bitten by them would definitely hurt a lot. 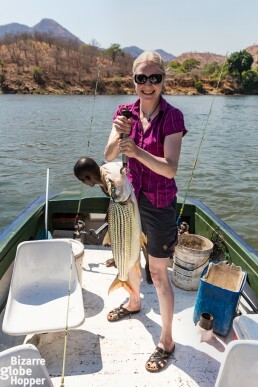 After posing with the tigerfish in a traditional fisherman-style, we released it back to the river. The “monster-with-the-needle-sharp-teeth” swam quickly away and dived under the surface, disappearing from our sight. Redcliff Lodge has a strict “catch and release” –policy, which I appreciate. 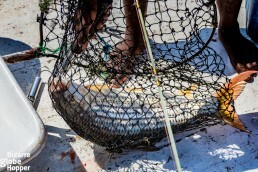 They will only keep the fish if it has got so badly injured during the catch that it won’t survive anymore. According to them, this happens very rarely. Check out the video about catching a tigerfish! We got back ashore around 11 am and chilled a bit while waiting for our filling lunch. At 2 pm we were ready to go off again. I started to understand how some people could do this for days; go fishing in the morning, spend some laid-back time in-between, and then go again in the afternoon, only to be back when it’s almost dark – just in time for dinner. It was very relaxing in its own, distinct way. Our guide and boat awaited us and, this time, we had some sundowner beers packed, too. This time the owner of the Redcliff Lodge, Hugo, joined us. He had earlier told that we were a bit of a rarity; he had never had an all-female “group” before.  We were pretty surprised since I could wholeheartedly recommend this for anyone. It had been such fun. 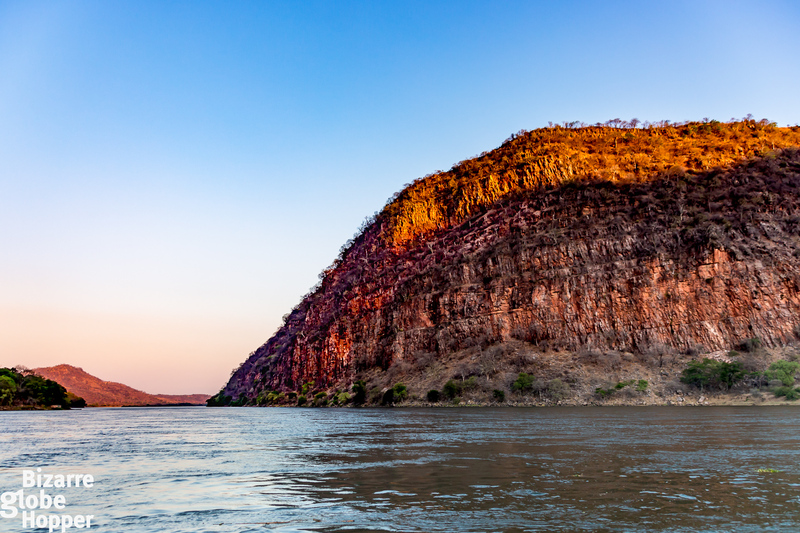 Water was splashing over the sides of our boat when we traveled again upstream, towards the best fishing grounds between the high, red cliffs, where our lodge has got its name from. 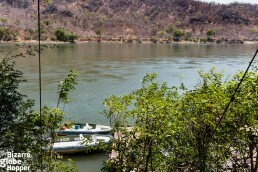 Occasionally we were floating between two countries; on the left shore was Zambia and on the right there was Zimbabwe. 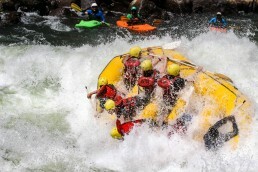 The current of the river carried our boat pretty rapidly, so from time to time we had to start the engine and go back upstream. 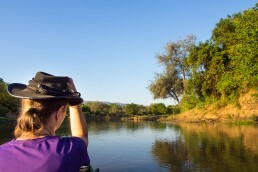 We had to try a few different places before finding a spot where the tigerfish began to snap. Between the sandstone cliffs, we uncorked a couple of beers, sat back, and listened to the sounds of the river. Meanwhile waiting for the fish to catch our alluring baits, we could spot hippos nearby, popping their heads in and out of the water. You can’t mistake the sound of a hippo, after all. Unfortunately, we didn’t have as good luck as we had in the morning with the tigerfish. We did manage to get some catches, Niina got two and I got one, but they were all much smaller monsters than Niina had caught earlier. However, that was hardly a drawback. 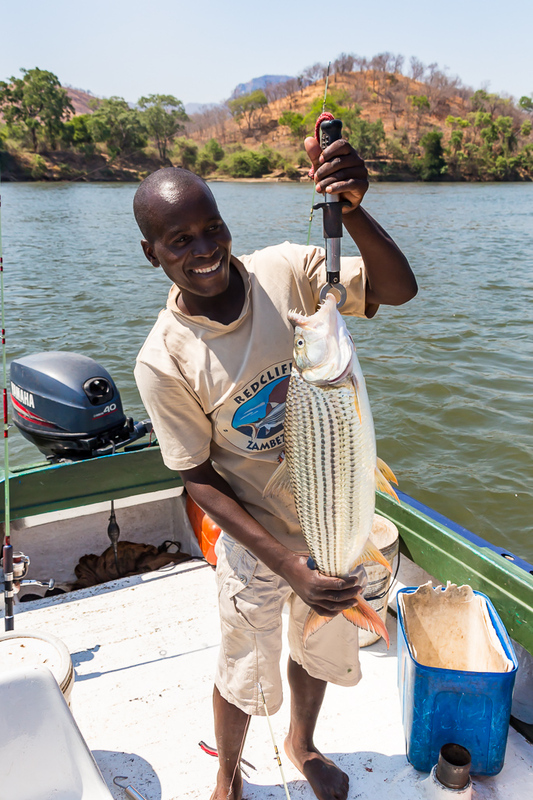 The thrill of catching a tigerfish, lifting it to the boat, and releasing it back to the river felt just as exciting every time. And spending idle time admiring the beautiful, African landscapes unfolding before our eyes with all its wildlife, was more than rewarding, too. After watching the dusk finally descending and sun starting to slowly go down the horizon while sipping our local, Mosi –beers, we left back towards our lodge. When we approached, we saw Chico running to the dock to greet us a welcome back. He is the owner Hugo’s little Jack Russell terrier – super-friendly, energetic, and a cute dog that is an essential part of the lodge’s warm heart and soul. Wrapping our fishing day up in the bar after the hearty dinner, with Hugo, Chico, and a couple of Mosis was a great ending to an exciting day. It had been exciting in a different way than in what we are used to, but it turned out that we enjoyed every minute. Even if you’re not a fisherman, I dare say that you would enjoy some leisure time like this. Not to mention the tall stories you can tell back home about the fish with the monster teeth that you caught! Redcliff Lodge is situated in the Zambezi Valley, on the northern bank of the Zambezi River, and between the village of Luangwa and the gorgeous Mpata Gorge. 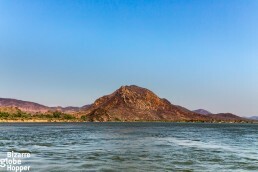 Lake Cahora Bassa in Mozambique is not so far away in the East. 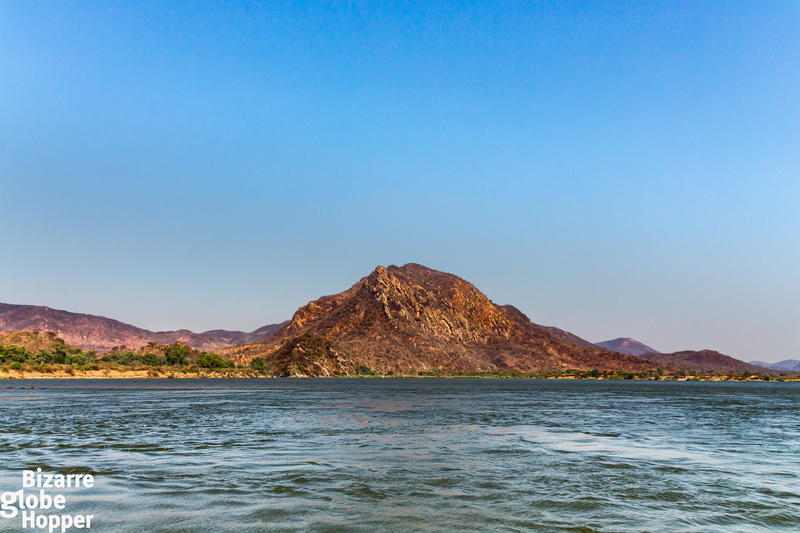 Lower Zambezi National Park’s eastern boundary is only about 10 km away. You can even take a boat ride to the National Park if you like. 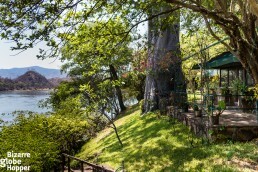 Though you will have to pay the ZAWA (Zambian Wildlife Authority) Park Fees, if you go there. 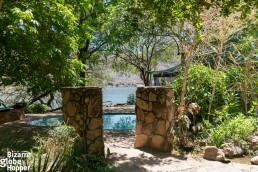 We would love to go back to Redcliff Lodge sometime. It felt like a home away from home. 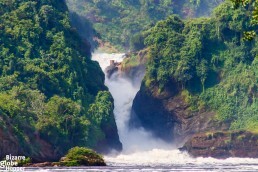 And if you’d like a great place to try out some thrilling tiger fishing, this would be a perfect spot. 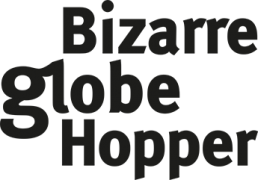 *Disclaimer: We were hosted on a tour around Zambia by the Zambian Traveller/Maxmas Travels, but all our views and opinions are entirely our own.